Pune: Giant Starkenn Sports Pvt. 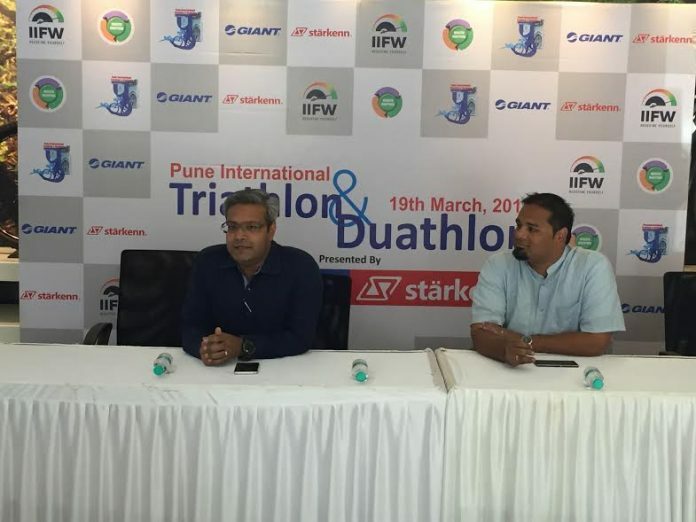 Ltd. in association with Indian Institute of Fitness & Wellness (IIFW) is organizing the Pune International Triathlon & Duathlon (PITD) in Pune on 19th March, 2017. This first-of-its-kind event which follows international triathlon norms is scheduled to be held at Manas Lake near Bhugaon in Pune. 850 plus fitness and cycling enthusiasts are expected to participate in this event. Participants are coming from across the country from cities like Mumbai, Delhi, Bangalore, Navi Mumbai, Baramati, Beed, Nashik, Kolhapur, Mysore, Noida, etc. The event will also see a few international participants from countries like South Africa and USA. Rules and regulations basis international triathlon norms will be implemented during all the races. The event is divided into two different races, Triathlon and Duathlon. Triathlon will involve three different sports such as Swimming, Biking and Running. Duathlon will involve two different sports which are running and biking. Each race will have its sub-categories such as Sprint, Olympic & Half Triathlon. Another first is a category for kids in both the Triathlon and Duathlon disciplines. Each category will have its own swim, bike and run distance. Triathlon event will start from Manas Lake and will end in the Balewadi sports complex whereas duathlon events will take place at the Balewadi sports complex. Mr. Pravin Patil, MD & CEO, Starkenn Sports. Pvt. Ltd and Dr. Anand Patil, Founder IIFW addressed a press conference today to announce this initiative. The ultimate aim of PITD event is to create awareness about health mapping and promote active and healthy lifestyle by engaging with the community.